Windows 7 Beta program registration URL is now live, although the registration process, and hence download of ISO and beta product key appear to be not yet working. The beta program for Windows 7, Windows 7 Beta Customer Preview Program is providing pre-release version of Windows 7 available to the first 2.5 million people who download, slated to begin anytime now on January 9, 2009. 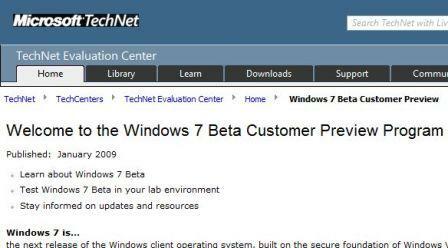 The Windows 7 Beta Customer Preview Program can be accessed via the following URL, which is hosted on TechNet Evaluation Center under Springboard Series, a section of TechNet dedicated to enterprise administrators and other IT workers. Everybody can directly download the Windows 7 ISO, and use the multi-use generic Windows 7 product keys to activate. The stop error is displayed on https://www.microsoft.com/betaexperience/productkeys/win7-64/enus/default.aspx or https://www.microsoft.com/betaexperience/productkeys/win7-32/enus/default.aspx. However, you can already start downloading the Windows 7 Beta ISO via leaked 32-bit Windows 7 beta ISO or 64-bit leaked Windows 7 Beta ISO, while waiting for registration to open to get a genuine working beta key to activate the installed copy. It appears that the previously leaked Windows 7 beta download page URL (http://www.microsoft.com/windows/windows-7/beta-download.aspx) also been redirected to TechNet site. Both Windows 7 32-bit and 64-bit versions are available for downloading. Each version is available in five languages: Arabic, English, German, Hindi (32-bit only) and Japanese.